The breadboard and jumper wires kit is ideal for setting up a trial circuit, prototype or experimenting. WHAT YOU GET - Package comes with 2 pieces 830-Points large bread boards, 2 pieces 400-Points mini bread boards and 120 pieces jumper wires for use in electronic and electrical experiments projects. HIGH QUALITY EXPERIMENT BREADBORD - The solderless breadboard is made of ABS plastic and can be fixed on a flat surface with adhesive tape at the back. The 830 Points breadboard is about 6.5" x 2.1" x 0.3"in size, and the 400 Points breadboard is about 3.2" x 2.1" x 0.3" in size. JUMPER WIRES RIBBON CABLES - The multicolored insertion wire is made of high-grade copper core, and is about 8" (20cm) in length. Totally 120 single axis that includes 40 pieces male-male, 40 pieces male-female and 40 pieces female-female. 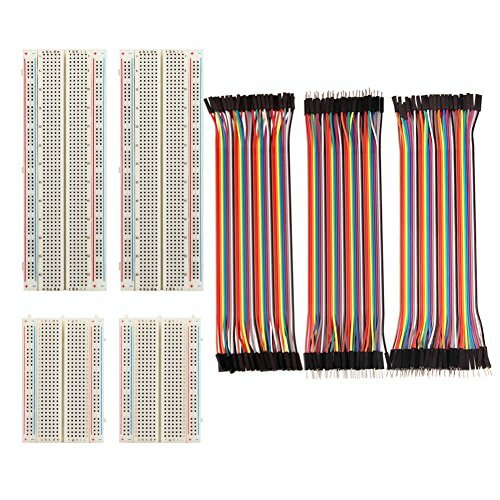 FITS FOR ARDUINO PROTO SHIELD - The breadboard and jumper wires kit is ideal for setting up a trial circuit, prototype or experimenting.